Glenna Napier Noble, age 78, of Carrie, KY, passed away Wednesday, November 28, 2018, at Hazard Appalachian Reg. Med. 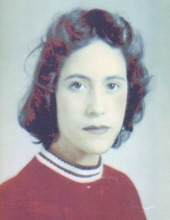 Ct. in Hazard, KY.
She was born in Ary, KY on July 30, 1940 to Andrew Napier and Stella Ritchie Napier. Funeral services for Glenna Napier Noble will be held at the Hindman Funeral Services Chapel, Saturday, December 1, 2018 at 11:00AM with Mickey Amburgey, Roy Slone and Don Pratt officiating. Burial will follow at the Nim Patrick Cemetery at Bearville, KY. Visitation will be held at the chapel, Friday evening after 6PM with additional services at 7PM. "Email Address" would like to share the life celebration of Glenna Napier Noble. Click on the "link" to go to share a favorite memory or leave a condolence message for the family.